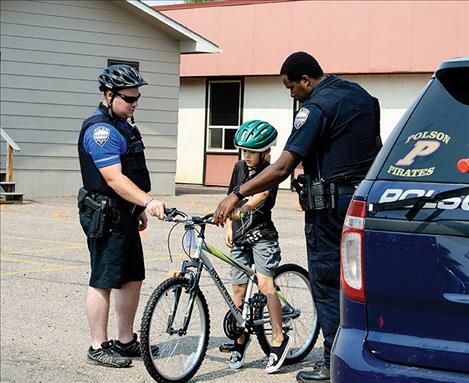 Polson Police Officers Keith Deetz and Hazeez Fafiu lower the seat on a bike so a child can ride it through their safety course during the Back to School Wellness Fair on Saturday. 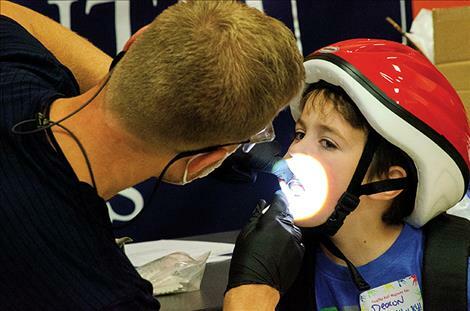 Dr. Joshua Ricks provides dental assessments for children at the fair. Lexi Clave learns about swimming pool safety from Mission Valley Aquatics with her father. Jacob Todd, 5, enjoys the fair. Lake County Search and Rescue President Jared Bell shows people the equipment the team brought to the fair. 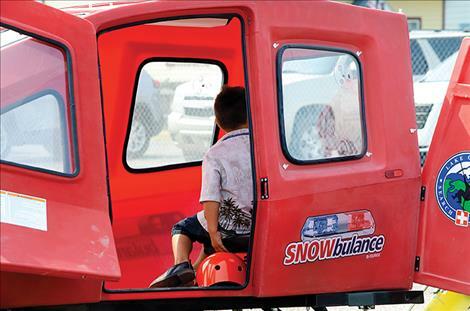 A child gets in the Snowbulance used by the LCSAR to rescue people on trails. Lt. James McKee with the Polson City Fire Department helps a child try on the gear firefighters wear. 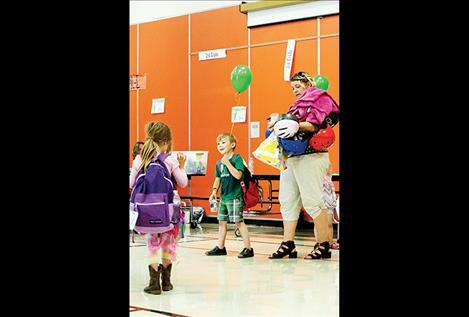 POLSON – Jacob Todd, 5, wanted to go fishing on Saturday morning, but he ended up going to the Back to School Wellness Fair instead and picked up a catch of a different kind. 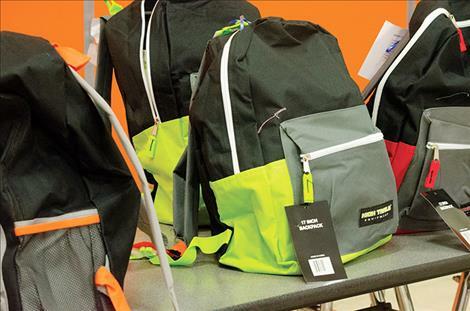 “Look at all this,” he said opening the backpack he received at the event. He had a coloring book from the Polson City Fire Department, some glue, pencils, paper, snacks and several other items. “This was funner than fishing,” he said. The Polson United Methodist Church organized the event with grant funding. 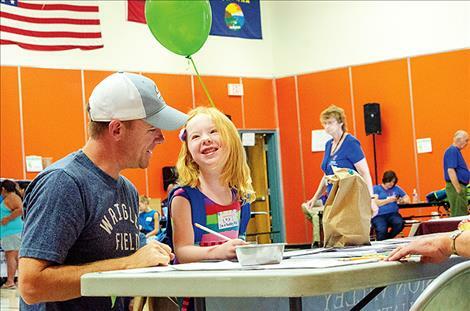 Several local organizations set up booths at the Linderman Elementary School event with activities and prizes for children and their families. 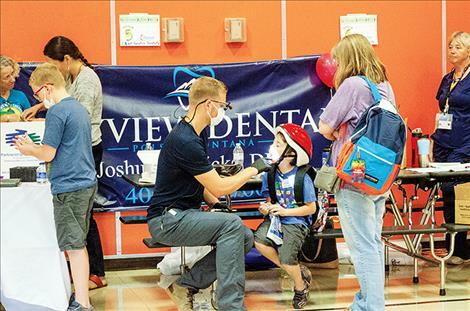 Professionals with dental and vision clinics were also on hand along with mental health and suicide prevention specialists. Representatives from the North Lake County Library attended as well to encourage reading. Pastor Janet Mulroy said church volunteers talked to people to find out what kind of an event the community needed a few months ago, and a wellness fair for children was said to be the biggest need. 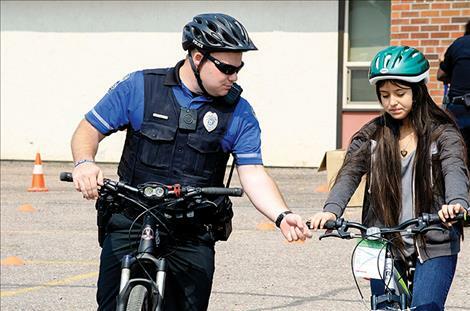 Police officers with the Polson Police Department set up a bike course for children to learn riding skills. The department gave away several free bike helmets and the Methodist Church provided more helmets and nine free bikes, which were given out each hour during a drawing. 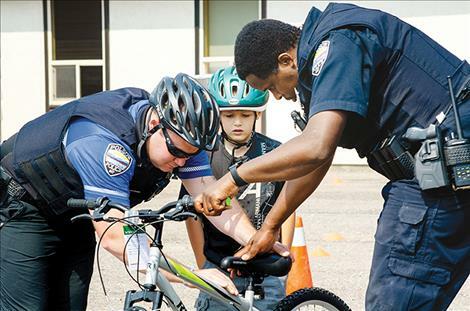 Officer Hazeez Rafiu said the children needed to participate in the bike safety course to enter into the free bike drawing. He said officers talked to the children about the importance of wearing a helmet and being safe in cross walks. Officer Keith Deetz rode around the course on his bike with the children to answer any questions the kids had about bike safety. 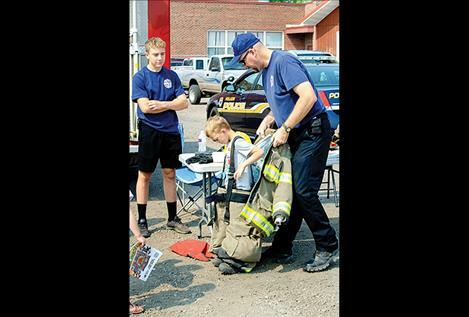 A Polson City Fire Department crew helped children try on the gear firefighters wear. Lt. James McKee, firefighter Jodi O’Sullivan and junior firefighter Nico River, 17, talked to several different kids during the afternoon about fire safety. They shared the mantra “close before you doze,” which means that people should shut their doors before they go to sleep at night because it helps keep a fire from spreading through the home if one occurs. Lake County Search and Rescue set up their equipment. They had a thing called a Snowbulance, which looks like a large pod on wheels, pulled by a side-by-side off road vehicle. LCSAR President Jared Bell said the pod is used to rescue people out on snowy trails. Bell said the team talked to children at the event about the importance of wearing a life jacket in the water and what to do if they got lost in the woods. The LCSAR team is comprised of a group of trained volunteers who help rescue people on land and water. Bell said this has been the busiest year in the past dozen years for rescues. “We had eight calls in ten days between July and August,” he said. 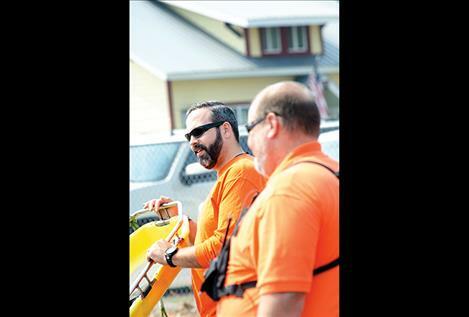 LCSAR is also working on raising funds for swift water rescue equipment. They currently have limited gear but used what they have to rescue one person this year. “We still need dry suits and special life jackets,” Bell said. The team has been selling raffle tickets for half a beef, donated by Bartel Electric, to raise funds for a utility vehicle, needed to rescue people. Tickets can be purchased by calling Bell at 406-261-4886 or from anyone with LCSAR. Mission Valley Aquatics set up a booth at the event and quizzed kids on pool safety. They encouraged children to get swimming lessons at the non-profit indoor pool in Polson. They shared a list of information about pool hours and different group programs that can be found at www.mvaquatics.org. A mental health team from Sunburst Mental Health and Family Concepts talked to parents about resources to help children with anxiety, trauma, and suicide prevention. 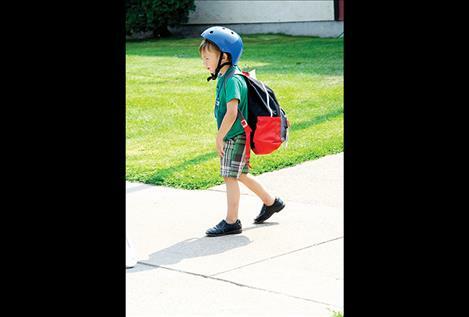 Julie Fleck, a licensed clinical social worker, said going back to school can be a positive experience for some children wanting to have a safe structured place, but other children might feel a sense of anxiety at the prospect of starting school. She talked to parents about teaching children to breathe through anxiety or focus their attention on counting when they are feeling stressed. Fleck said it gave her a sense of hope that many people were asking about suicide prevention. “They wanted to know how to talk to their kids about it.” She said the fact that people were asking questions about suicide is a good sign that the stigma around the issue is changing. Despite funding problems, Fleck said resources are still available. She encourages people to seek help for any child or adult needing mental health support or having thoughts of suicide. Pastor Mulroy stood at the door along with Sherrie McFarland as the event started winding down. Recalling what happened after a young boy won a bike, brought tears to the women’s eyes. McFarland said it was a great moment to watch. “It’s been a really good day. It was a great event.”d at www.mvaquatics.org.